By Dennis W. Viau; modified from one of my own recipes. Clam chowder is one of only a few soups I occasionally crave. Most of my soups and stews are particularly satisfying in winter, but clam chowder can be enjoyed any time of year. 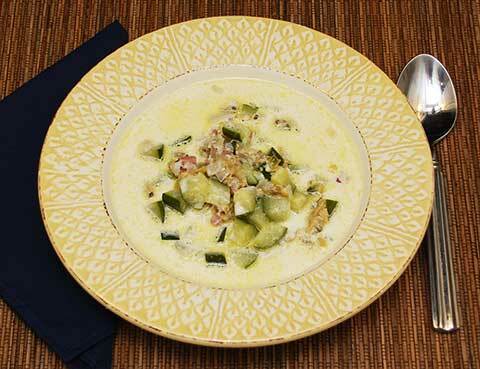 For this recipe I removed the potatoes, which are not keto friendly, and substituted zucchini. I also added cream. The result is a chowder that is just a delicious as the original. Drain the clams, retaining the broth in a separate bowl. Set the clams aside until needed. Melt the butter in a large saucepan and add the chopped onion. Sauté over medium heat until tender and translucent, about 5 minutes. Add the zucchinis, prosciutto, clam broth and water. Bring to a boil, reduce the heat to low, and simmer until the zucchinis are slightly tender, 2 to 3 minutes. Add the clams and cream. Season with black pepper. Return to the boil, reduce the heat, and simmer about 2 minutes. Remove from the heat, cover, and let stand at least 1 hour to allow the flavors to develop. Reheat and taste for salt. Serve. This chowder will taste even better the next day. *I have made this clam chowder with chopped stems of broccoli and/or cauliflower for a slightly different flavor, but just as delicious.